The Kindle Fire is for the birds. I mean that in a good way. Yesterday my Kindle Fire appeared in the mailbox. I immediately unpacked and set it up to see how it compared to other tablets as a field guide for birding. I downloaded iBird Pro from the Amazon app store and this is a review of what I found. I’m going to keep this short. Caveat: I believe I can write intelligently about the Kindle Fire because as an app developer I’ve tested our Android product on about 20 different tablets to date. (In a future blog I’ll compare those devices.) I’ll start by giving you a quick overview of the good and the not so good about the device for the average person contemplating a purchase. After using the Kindle Fire for a day I am extremely impressed and 100% convinced it will turn the entire tablet market upside down. In doing so it will grab a lot of share from Apple (and help Google in the process to dominate the mobile market). The most impressive thing about this device is its price of $200. Most tablets on the market cost around $500, so a $200 tablet is amazing. Compared to the iPad the Fire is missing a lot of features but on the other hand its incredibly low price may prove many of those features superfluous to most people. iSuppli pegs the Fire’s build cost at $209.31 while Piper Jaffray puts it at $250. The strategy of Jeff Bezos is brilliant: sell the hardware at a loss and make it up by sales of Amazon products though the Kindle. Using the Kindle to buy products in the Amazon store is a breeze, the browser is customized specifically for that purpose. We’ll have to wait and see if the profits can make up for the losses. WiFi gave inconsistent results when used with AT&T WiFi inside Barnes and Noble! This was the case in the first store I tried but the next day at a different B&N it worked fine. Looking at the Pros and Cons list you might conclude that there are way more things I don’t like than I do like. Actually I made up the list of Con’s with other tablets in my mind at the time, and it’s human nature to find things wrong easier than things right. So don’t take the imbalance as a negative. I’m convinced that most of the Con issues will be fixed in subsequent Amazon updates. These are the things people who like to bird will want to be aware of about the Kindle Fire. Overall compared to other tablets the Kindle Fire offers the best cost and value tradeoff for birding. The only real competitor to the Kindle Fire, in this birder’s opinion, is the new $199 iPod touch, which is not a tablet, but a smartphone minus the phone. While the iPod touch has a superior interface and can fit in your pocket its small screen means it’s not as good for reading books and surfing the web, so a personal choice has to be made carefully between these devices. The other 20 tablets I’ve used are either too heavy, too big, or too expensive. If I had to pick one “high-end” Android tablet today it would be the new Sony. It has a beautiful hardware design, and is amazingly light weight. It is great for arm-chair birders who don’t mind spending $500. The other tablet I would consider if I was not concerned about cost would be the Samsung Galaxy Tab 10.1 running Android Honeycomb 3.2. I recently upgraded my Galaxy tab from OS 3.1 to OS 3.2 and it was a huge improvement. The big surprise for me when I unpacked the Kindle Fire was it was already turned on! Which was confusing because it was not clear what to do next. There was not one sheet of paper describing how to start the device and I could not find an on/off button. Eventually I found the tiny button next to the charger receptacle on the bottom edge and when I pressed it the title Kindle Fire on the screen started rippling and I took this as it starting up. Still this is not grandmother friendly. The packaging gives an impression of cheapness and an “I really don’t care what the user experiences when they open my product for the first time”. I think Jeff Bezos does not have the sensitivity of Steve Jobs when it comes to presentation. Or maybe he will after he reads this review (yeah dream on). The next surprise was the Kindle Fire opened what looked like a registration screen and already had an email address for me set (name@kindle.com). There was a link called Deregister but I was not sure what to do so I pressed it and it let me enter my normal Amazon user name (but not a password). However later I discovered the @kindle.com address was still enabled. I was able to press Deregister again and this time when I entered my normal Amazon email account it actually took. You really want to change the Kindle Fire account email address right away otherwise the apps you download will have to be re-downloaded. Apps are always associated with the email address you log into the Fire with. Next I was presented with a WiFi setup screen that didn’t show my main WiFi account. I had to take it closer to the router to get a stronger signal. I think there is some weakness in the WiFi hardware and this is why I gave it a “wonky” note in the Cons section. The last surprise was before I got to the home page the Kindle Fire needed to be updated with new Amazon firmware. This update process took a half hour to download and install. When it rebooted the device there was a long period where I could not tell if it was starting up or stuck. Amazon left all the waiting indicators off the design which will have you scratching your head at times wondering what its doing. Amazon could have included a tiny low cost LED that blinked when the device was busy, or just used the customary spinning cursor, but perhaps they have reasons for dropping activity indicators I can’t fathom. One thing is clear about the Kindle Fire: it’s the first true competition to the iPad. Imagine you are an Android tablet manufacturer today. Lacking Amazon’s huge online infrastructure the only way you can compete is by adding new hardware features. And that means raising the price which will just push more customers into Amazon’s grip. And while Apple can counter Amazon’s store with its iTunes ecology the iTune’s store is only good for media like music and video and software like apps. Jeff Bezos says Apple’s approach is to sell hardware at high margins while Amazon’s approach is to sell everything at low margins. Both approaches have pros and cons but if you think about it Amazon’s more varied product strategy gives them insurance should people tire of the excitement around tablets and smartphones. There are many extensive reviews on the Internet about the Kindle Fire (for example see David Pogue’s excellent and amusing Fire Aside, Other Kindles Also Shine.) These reviews are not all as positive as mine but I think that’s because there authors are trying to compare the Fire to an iPad or expensive Android tablet by features rather than ecology. In such a comparison the Fire won’t win. There are also a lot of debates about whether the Fire is an iPad killer and several other controversies. 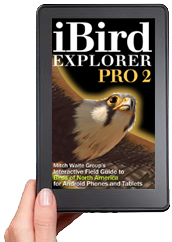 However it is my opinion that if you are a birder you will be VERY happy with the Kindle Fire. One recent review in the New York Times (As Kindle Fire Faces Critics, Remedies Are Promised by David Streifeld, Dec 1, 2011) raises some interesting points regarding the different impressions people have. It reminds me of the story of the blind men describing an elephant by touch. In various versions of the tale, a group of blind men (or men in the dark) touch an elephant to learn what it is like. Each one feels a different part, but only one part, such as the side or the tusk. They then compare notes and learn that they are in complete disagreement. One reviewer is particularly negative. This particular review, in this writer’s opinion, Mr. Neilsen seems to have got stuck touching the tail of the elephant. It’s always easy to find things wrong with version 1.0 of any software product and that is why I recommend you stand back and see the product as dynamic and evolving. Mr. Nielsen seems foolish to underestimate Amazon and discount the Kindle Fire. Right now there is a major fight to be king of the tablet between Amazon, Google and Apple with Samsung quickly gaining traction on everyone. This epic battle is unlike those of the past that relied on who offered the best hardware. Today all companies have access to roughly the same hardware technology and so these companies are looking for other ways to win the tablet battle. Right now Apple owns most of the market from a profitability viewpoint by choosing a strategy of the best hardware, the most fun interface and its iTunes and iCloud ecology. iTunes offers a huge number of apps, songs and videos which are now, though iCloud, seamlessly integrated with the iPad hardware (you no longer have to sync your iPad to a computer running iTunes). While Apple has had an enormous lead in the market and its hardware has super high margins, the field is rapid shifting because of Google’s Android OS. The recent addition of iCloud is Apple’s attempt to make the use of the iPad even easier than before, and to allow all your media and apps to live in the cloud instead of taking up room on your device. Both Amazon and Google are attempting to unseat Apple’s lead in the tablet market by jumping beyond just media. While they both provide music and video stores, Amazon beats Apple with over one million ebooks plus an online supermarket with unlimited products you can buy. Think of Amazon as the Walmart of the tablet makers. You would think that with Amazon having such a killer infrastructure that Google is handicapped in this race. Right now Google is working very hard to bring Near Field Communication or NFC to the Android standard. NFC is the ability to for devices to be used as credit cards by communicating with card readers in stores. They call this an open commerce ecosystem and the official name of the feature is Google wallet. Thus Google hopes to leap over Amazon by allowing any Android tablet or phone to tap into every store in the world that takes credit cards. Thus rather than being limited to just the products that Amazon has in there warehouse you have access to every store that offers an interface to Google Wallet. That is a huge vision. Google also has YouTube which they are attempting to turn into a television network on the internet and they are working on Google TV to bring every Google product to your living room flat panel television. With such a competitive race it’s very difficult to choose who will be the winner but one thing is certain; consumers are going to be offered amazing products as companies fight for their allegiance. Despite Amazon never giving out the units sold of any Kindle model (unlike Apple who loves to brag about their awesome numbers), analysts are predicting that the company will sell between three to five million Fires this quarter. (1) I bought the Belkin Verve Tab Folio for Kindle Fire, Purple case because it had good reviews on Amazon, it’s leather and I like the color purple. However there are many choices. (2) Search the web and you’ll find how to trick he Kindle to download apps not in the Amazon store and I am not describing jail-breaking the tablet (Nonetheless I take no responsibility for this and your on your own if you do it). (3) The apps are on there way I am sure, just be patient. This is my first video of how to use the iBird Search Engine. Its Part 1.